Police in Evesham NJ say they are cracking down on the wildly popular vaping or juuling form of E-Cigarettes. Teenagers under 18 now face potential fines if they are caught possessing vaping instruments — the battery-power smoking paraphernalia — in the New Jersey township of Evesham. The new local law was adopted April 5 after local police and township officials decided to tackle what has become particularly worrisome at Cherokee High School, Evesham Officer Bob Hansbury told NBC10. Hansbury, the school resource officer at Cherokee, said vaping has become pervasive and is easy to conceal. "From what we saw, it was a lot more than we actually thought," Hansbury said. "They would have it in their hands. They would go into the bathrooms for a couple seconds. Then they would take a puff with the vape and then they would walk back out." 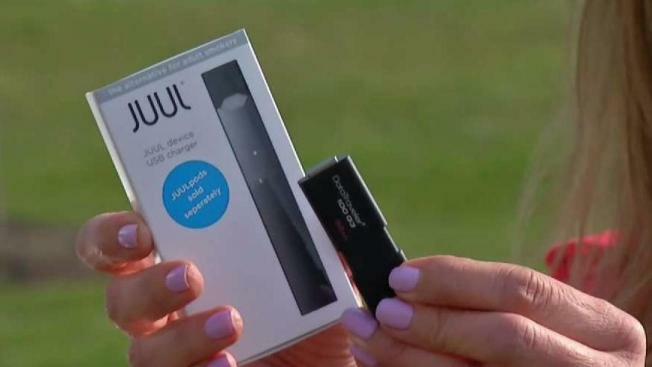 Anyone under 18 caught for the first time with vape "pens" or other electronic smoking products, like the popular brand called JUUL, will be given a written warning. Their parents will be notified. The second time will result in a $50 fines. The fine will increase with each subsequent time. The smoking products will also be confiscated, Hansbury said. Parents have generally been receptive to the crackdown and new law, Hansbury said. It will also help convey the seriousness of smoking to the teens, the officer said. "The kids don't really know how serious it is," Hansbury said. "One pod is equal to 200 puffs, which is one pack of cigarettes."